Love in Lowercase by Francesc Miralles is a heartfelt story about noticing how the little things in life are what truly define us. Samuel is a bachelor who until recently enjoyed his solitude and routines. However, now that the new year is upon him, he realizes that being alone may mean that no one notices when he is gone. Pondering his existence, Samuel hears a scratching at his door and in strolls a cat who immediately makes himself at home. Letting the cat into his apartment is just the catalyst that Samuel needs and before long he is making new friends and finding love. The atmosphere that Miralles captures is tangible and wonderful. You really feel the beat of the city as you travel around from music stores to cafes with Samuel. Miralles creates such vivid and entertaining characters that you immediately fall in love with them. Samuel is a bit nutty but I enjoyed seeing how he changes his outlook to being more positive. 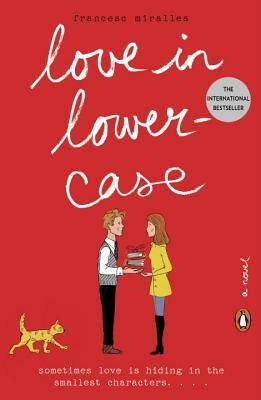 All of the characters are smart and often have profound, and humorous, discussions that will have you seeing love in lowercase too. A fabulous escape read that will leave you with a warm feeling and a new look on the world.